Kinesis is the market-leader in computer ergonomics and has been designing premium keyboards for more than 25 years. The award-winning Freestyle2 keyboard is perfect for those looking to increase their productivity or enhance their comfort, at home or in the office. The Freestyle2's unique split-adjustable design allows you to position the key modules at shoulder width or connect the included pivot tether to splay the key modules- choose the configuration that works best for your body type. Low-force, tactile keyswitches provide a satisfying typing experience and are very quiet. The Freestyle2 features an embedded numeric keypad for easy access to the 10-key. And since the Freestyle2 uses a standard key layout, there is no learning curve. 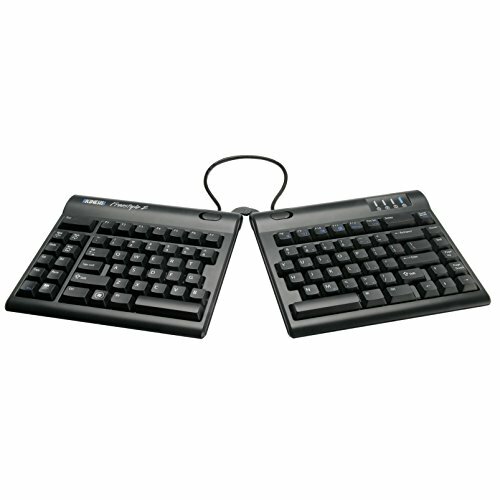 Add the optional Palm Supports with gel pads to keep your wrists neutral, or add the VIP3 or V3 lifters which attach to the base of the keyboard to provide reproducible tent settings of 5, 10, or 15 degrees which greatly reduces forearm tension. PC-specific driverless hotkeys support common shortcuts like cut/copy/paste, multimedia actions, calculator and much, much more.